Make sure to bring your prescription medication and a doctor’s note. Everything else can be bought here if you are staying in or starting out in a highly touristed area. On Koh Tao you will only find Nivea brand roll-on deodorant. Bring everything you can, either from your home country or from mainland Thailand. Things are more expensive on Koh Tao. But, don’t bring the things that will make your journey to Koh Tao too inconvenient. You can still get everything you need on Koh Tao, even if it’s at a higher price. The price difference isn’t worth over packing. Bring what you can, buy the rest. You can use a suitcase or a backpack. If you use a suitcase, you might want to hire a taxi to take you to or from your hotel. You can buy tourist clothes here. You can find things like sarongs, Tiger Beer t-shirts, long drapey dresses, swim suits, and the like; basically, anything that makes you look like you’re on vacation in south east Asia. If you want running shoes or clothes that look unique, you will have to, at the very least, visit Koh Samui. Travel towels (Nabaiji brand to be exact) can be purchased here, for a not very high price. But, maybe travel towels are cheaper on mainland Thailand. Bring your towel if you are staying in a hostel or going to the beach. Or, you could just buy a beach towel here if your hotel doesn’t lend you one. You can buy all of these at any store. It’s mostly Nivea brand products and some other brands I’ve never heard of before. On Koh Tao you will only find Nivea brand roll-on deodorant. So if that’s what you’re into, you’re set. You can find some of the major brands here like, Banana Boat and Hawaiian Tropic. It’s best if you know the generic or chemical name of the drugs you need. Instead of asking for Bufferine, ask for ibuprofen. I would still bring some medications for basic illnesses like diarrhea, fever, and constipation. Don’t run out of these. It’s tough to look for medication when you’re already sick. It’s easy to find what you want if you have a label of the drug you are looking for. They sell the best brownies I’ve ever bought outside the US and for only ฿50. but, it’s cheaper to rent a scooter for a day than to pay for a one-way taxi ride. If you’re going to stay here for a few weeks or more, it’s cheaper to buy a scooter then sell it before you leave. Many sell their scooter for the same price they bought it. Most things are within walking distance from Mae Haad and Saree Beach. There are some interesting things and nice beaches that are about a 90 minute walk from the main area, but the blazing hot sun and lack of sidewalks make it a very unpleasant walk. Most people speak enough English to do their job. 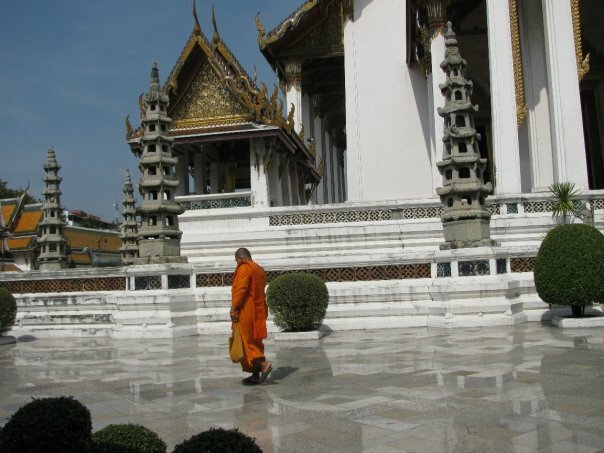 It is easy to learn a few basic Thai pleasantries and polite words. No Name Chicken and No Name Vegetable are popular dishes here. Just about every shop has an ATM nearby. Not many scams on Koh Tao. Just be careful when going out drinking. This is when you’ll most likely to be taken advantage of. Don’t rely on people you’ve just met to take care of you when you’re drunk. You can enter by plane, boat, bus, or train. Most citizens from many countries do not need to get a visa before going to Thailand. But, you will need a visa to stay longer than 1 month or if you been to Thailand for at least 3 months already in the past 12 months. People of most nationalities will get a 30-day visa at the port of entry. To be completely sure, check with the Thai embassy in your country. 10 LAWS IN THAILAND TO BE AWARE OF! Do not say anything negative about the king or anyone in the Royal family. And definitely do not write anything bad about the king or royal family. This offence could land you in jail. You don’t want to go to Thai jail. Don’t use the city ferries in Bangkok during the peak hours. They fill those things past capacity and sometimes they sink. Use them during non-peak hours when they are not crowded. Never eat female horseshoe crabs in Thailand. The roe of the horseshoe crab has tetrodotoxin (TTX) which is toxic to humans. It makes people very sick and some people have even died as a result. Mark and I took an overnight boat from Koh Tao to get to Myanmar to renew our visa. This (border run) visa run did take a long time, but it was very easy. All we had to do was buy a ticket for a Myanmar visa run. Then we showed up in time for our boat. After that, all we did was wait at various periods and not stray too far from the group. Around 10:30 on the night of the 27th, Mark and I made our way to the area where the night boats dock. We checked in with a lady playing on her smartphone in front of the boats. We ticked our names off a list on a sheet and then boarded. We climbed the stairs and found our bunks. I fell asleep right away while Mark watched a movie. We were both woken up early the next morning when the boat pulled into the dock at Chumphon. At Chumphon we waited for an hour before our vans came to pick us up. By then most of the people from the overnight boat had left. There were only 15, or 2 vans worth, of us doing the visa run that day. While we waited, some old French guy kept going on and on about the free coffee available in the waiting area. No one was really interested. He couldn’t understand how free coffee from a questionably dirty coffee pot had no appeal to anyone. He had about 3 cups while complaining about the snobbishness of the people around him. The guy who had just handed over his lighter gave the old man stink eye. His friends laughed and turned away from the old man in disgust. The young man took back his lighter and joined his friends leaving the old man on his own. I looked down, not wanting to make eye contact. I don’t speak French, but there was a chance that the old man spoke English just well enough to harass me during the whole visa run. Just in case, I got up to “check on something”. The old guy moved on to another group. They were speaking in English, but they had heavy accents. “Where you from?” the old guy asked. “Quebec,” one of the young ladies answered with a smile. Within 20 minutes the old man was chattering away in French as the Québécois sat around him being quiet and unhappy. The man had bummed a cigarette off of one of them and was asking for another when the first van pulled up. All the Canadians jumped into the first van, leaving no space for the old guy. He would ride with Mark, me, and the French boys in the other van. With his filthy feet up on the wall of the van, he snored the whole ride to the border. But, maybe that was better than him talking all the way. Everyone slept for most of the ride. It wasn’t too bad as long as I closed my eyes and tried to forget about the old man’s grotesque feet perched at eye level. I realized that I would get no iced Thai coffee. I gave the woman my passport for her to make a photocopy. Mark and the others did the same. After which, Mark and I crossed the road and stood in line at the Thai boarder control. It’s not “safety time” right now. With our exit stamps from Thailand in our passports, we all got on one of two long tail boats. I sat in front of Mark, who sat next to the French old man. The man asked Mark if he had any cigarettes, but Mark didn’t have any. Neither did I. We were on the boat for about 10 minutes when the guy controlling the boat, the “captain”, yelled something. “What! ?” many of us asked. The captain pulled at his shirt, like that was supposed to mean something, but no one understood. Then he cut the engine and climbed along the outside of the boat to make his way to the front. Standing at the front, he pulled at a life vest that was hanging from the top of the boat and said, “Safety time!” He dragged out the word “time” and cocked his head to one side to let us know that he thought we were stupid. I pulled on the vest closest to me. It was ragged with a tear all the way down the side under the arm. Most of its stuffings were coming out or had fallen out a long time ago. There was no way this life vest was better than wearing no life vest at all. It couldn’t even work as a pillow. Once everyone had their life vest on, the captain started the motor and we passed the border police. When the cops were behind us, the captain told us we could take off the vest. Safety time was over. I was glad to be rid of my vest; it smelled funny. We got off the boat and entered Myanmar. We walked to the immigration office. In the photo above, it’s the building on the right closest to the water. We spent a good 10 minutes there. Everyone handed over their passports and a 10 dollar bill. Someone turned in all the copies of our passports we paid for in Thailand; maybe it was the captain. When we got our passports back, we were given 10 minutes to do whatever shopping we liked before getting back on the boat. Mark and I ran to this park next to the immigration office for a few photos. This would be the shortest time we’ve ever stayed in a country so, we wanted to make the most of it. We got back on the boat and headed for Thailand. This time Mark and I sat towards the front of the boat. Behind us was the old French guy, shirtless, and with a bottle of beer in each hand. During the “safety time” on the return journey, the captain asked him to hide his beer. He hid the beer in his belly by chugging both beers and mumbling French nonsense to himself. We got through Thai immigration with no problems. Even the old drunk French guy had an easy time of it. Everyone went to 7-Eleven for toasties, drinks, snacks, and cigarettes (to give the old French guy). The French guy went MIA. I didn’t see him in the 7-Eleven with everyone else. When it was time to head back to Koh Tao, we got into the vans. Not everyone returned with us; some stayed. This meant that there was now room for the old French guy in the van with his new Canadian friends. So, that’s where he went, though I didn’t know this at the time. I thought we had just left him behind. It wasn’t until the driver stopped for a smoke and a pee, that I saw him get out of the other van. He walked over to our driver and asked for a cigarette. By the afternoon we were on a fast boat back to Koh Tao. We were back on Koh Tao by 3:30 that afternoon. If you are staying on Koh Tao and need to renew your visa you might have some questions. Just remember to check government websites to make sure your information on the process is up-to-date. Things change often. Also, make sure the day you travel is not a holiday in either Thailand or Myanmar. Now, let’s go over some simple questions you might have about doing a Myanmar visa run from Koh Tao. 1. When should I buy my ticket? If there’s a holiday coming up, tickets might run out. In this case, I advise that you get your ticket as soon as you know you need to renew your visa. Other than that, you can get your ticket right before the travel agency closes on the day you want to go. But, don’t push your luck. Let’s say your visa expires on the 10th. I recommend, assuming there are no holidays involved, going to a travel agency on (or before) the 8th and buying tickets for a night boat leaving Koh Tao on the 9th. This will have you at the Thai Immigration office on the 10th, renewing your visa when it expires wasting no days with overlapping visas. You need to renew your visa on the day it expires at the latest, to not have to pay a fine. The fine is only 500THB per day past the expiration date, but it’s best not to live life too far on the edge. 2. How much does the ticket cost? About 2,300THB per person as of March 2018. Prices are about the same no matter what travel agent you go to. That said, it doesn’t hurt to shop around if you have time. The night boat is scheduled to leave at 22:30. You will return to Koh Tao by 15:30 the next day, assuming everything goes well. 4. What should I bring to get my visa? This is the form you get when you arrive at the airport. You’re supposed to keep it, but if they don’t staple it in your passport for you, it will get lost. I don’t remember now if we needed them. We had them and they took them, but they never asked for photos. So, they might take a photo if you have it. A shirt and decent pants/ skirt. Of course there was a “that guy” who had to be told to put a shirt on. 6. What do I not have to bring? 10USD for your Myanmar visa. This is included in your ticket, so there is no need for you to bring any US dollars. Do not fold the10-dollar-bill. The government of Myanmar do not like folded bills. I don’t recommend going to Myanmar. If you’re going to Koh Tao, you might want to know what you have to bring and what you can just buy there. So, I will explain that here. First off, realize that Koh Tao is an island that takes a while to get to, so everything will cost more when you buy it on Koh Tao. But, it’s not a huge difference in price. If it’s convenient to stop off at a Big C or Tesco Lotus before going to the island, then do so and buy some basics. Get your bug spray, shampoo, sun block, and so on. On the mainland you will have better prices but importantly, more brand choices. Don’t have to go over board. You don’t need to bring everything or a 3 month supply of anything. You can get everything you really need on Koh Tao. You can get all your scuba gear on the island. There are many dive schools and dive shops that sell everything you need or want. I don’t know about brand selection, but I’ve never heard anyone complain about it. You can also buy (or sell) used stuff online at Koh Tao for Sale or Koh Tao Dealerz. Both Facebook Groups offer more for sale than just scuba gear. You’re going to need lots of Off!. If you’re out and about after 16:00, make sure to coat your arms and legs with it. Don’t forget to wash your hands after putting it on. You don’t want to accidentally ingest the stuff. On Koh Tao you can buy Off! in just about every shop from 7-Eleven to groceries or pharmacies. If you want the best sunscreen, as evaluated by Consumer Reports, then you should bring some from your home country. If not, you can find plenty of sunscreen here. Stay away from the brands you’re unfamiliar with. I have heard bad things about Samui Rum Leuk, the sunscreen made on the neighboring island of Koh Samui. Brands like Nivea, Banana Boat, and Australian Gold can be found at 7-Eleven, pharmacies, and grocery stores. It’s cheaper to buy rubbing alcohol from a grocery store than the pharmacy. You can get a small bottle for 15THB. You can buy a quick dry travel towel from many of the dive shops on the island. Nabaiji is the main brand that is sold on the island. Mark and I both have one. They came with something we bought. The most common sizes are XL and L, but you can find XXL, M, and S. The XXL will cost about 450THB on Koh Tao, which isn’t bad at all for a quick dry travel towel. You might be able to find that same brand for cheaper on mainland Thailand. But 450THB (14USD) is so low for a travel towel, it might not be worth it to go out of your way for it. I found the XXL Nabaiji travel towel for 450THB at a convince store along Sairee beach. Ibuprofen is the generic name for Brufen, Advil, and Motrin. Paracetamol, also known as acetaminophen or APAP, is the generic name for Tylenol and Panadol. The Ibuprofen on Koh Tao, comes only in double (400mg) or triple (600mg) dosages. Usually ibuprofen capsules are 200mg. Most people take 2 pills at a time, so the double dosages might not be a problem. Just remember this and don’t accidentally take 2 of these bigger pills. Remember not to take more than 1,200mg in a 24 hour period. Taking too much Ibuprofen can damage your stomach lining. As for paracetamol, taking more than 4,000mg in a 24 hour period can cause liver damage. It’s very important to read over the counter drug label’s properly. Many cold medicines contain paracetamol, like Thera-ful and Nyquil. This makes it easy to overdose on paracetamol without realizing it. Pain killers are cheapest when bought from the grocery stores. They are a bit expensive at the pharmacy. If you only need one or two pills, then buy a packet of Tylenol (paracetamol) at 7-Eleven. If you want the ibuprofen in liquid capsule form, you will have to buy it at a pharmacy. You never know when the bathroom is out of toilet paper. When you run out of tissues, pick some up anywhere. There are shops everywhere selling clothes, hats, bags, and flip-flops. They look nice, but they’re not exactly top quality stuff. They will last the length of your trip, but not years. It doesn’t matter, nothing is too expensive. The main downside, is that you will look like everyone else. All the tourists are wearing the same thing. I recommend bringing your own swim suit. If you want to buy a swim suit here, then let it be a secondary swim suit. That way, if you don’t find one that you like or in your size, it’s not a big deal. Some days you will forget to put on your bug spray. Hydrocortisone Cream will help your bug bites stop itching. You can buy this at the pharmacies. You might not care about having one, but I hate collecting tons of plastic bags every time I buy something. I try to bring my own bag to cut down on the number of plastic bags kicking around on the island. You might be able to find fucidin ointment on mainland Thailand. But once you get to the island, antibiotic cream is harder to find and expensive when you do find it. Bring one head for every month you will stay on the island. On Koh Tao, they sell mostly name brand dry bags. Buy yours at home or from mainland Thailand, where they are much cheaper. The one in the picture is a generic dry bag I bought in Malaysia for less than 8USD. Get a heavy duty dry bag for kayaking and water sports. They keep your things dry even if it falls into water, assuming you’ve closed it properly. Do not get a camping dry bag. Those keep your stuff dry during a light rain but are not recommended for use at the beach. If you’re walking around at night I recommend getting some kind of reflective band. Not every street has a street light. Also, you should bring a flash light or use the flash light app on your phone. Never go anywhere without your phone for this reason. You can buy antiperspirant/ deodorant on Koh Tao. They sell products for both women and men. They are limited to the roll-on type and to the Nivea brand. If you like something else, get it before going to Koh Tao. A. There is plenty of Tiger Balm. B. Go through the grocery/ hardware stores before you buy anything. There are several grocery stores on the island that sell all sorts of things. They have far better prices on drugs than the pharmacies do. Buy your ibuprofen and paracetamol there. Also check these place out first when looking for stuff to buy. If they sell the thing you want, they might sell it for less. C. Check out many pharmacies for the basics before you buy. They’re prices vary for different items. Some have cheaper hydrocortisone. Others have cheaper antihistamine. It’s pretty inexpensive, but you can rack up quite a bill for just about anything if you’re a chump. Koh Tao means “turtle island”. There are no turtles on the island, but the island is shaped like a turtle. Well, at least the person who named the island thought so. ◊Koh Tao has the nickname “Murder Island”. Some people think there is a serial killer on the loose. Maybe there is. I don’t really think so but, I could be wrong. Many of the people who were “murdered” were very drunk at the time. Some of them jumped into pools and drowned. A lot of the “murders” were incidences of parents of 20-somethings who couldn’t believe that their kid would get so drunk and fall into a pool, run off into the jungle, or whatever. There are some cases that are clearly murders and the authorities have either found no suspects or they might have imprisoned the wrong people. Many people rent scooters here and then crash them. Some are just bad drivers. But many are driving drunk. It’s scary how common it is for tourists to get drunk then jump on their scooters and end up in the hospital. DO NOT walk around in the early hours of the morning when the drunks are likely to be driving home. Don’t assume you know what a dish is by its (English) name. If you want better service, you might have to pay more. Almost every restaurant is more than just a restaurant. The closer you are to the beach, the more you will pay and the less delicious the food will be (unless you are really paying more). If a restaurant is good at making Thai food, 95% of the time it will be bad at making western food. Street food is delicious and cheap, but many of them cannot be counted on. I mean that just because a stand was in a spot yesterday at 17:00, doesn’t mean that it will be there at 17:00 today. Sometimes a lady selling spring rolls from a cart one day, will be selling soup the next. Keep in mind that I’ve only ever gone to restaurants that I can walk to from the Mae Haad area. I don’t do scooters. Also, this is just my opinion based on observation and my tastes. I could be wrong or things might have changed by the time you read this. There was a little shack restaurant I would visit almost daily. I loved their Crispy Pork with Kale. The pork was crispy on one side and fatty on the other. There was so much dark green leafy kale with this dish, it probably counted as 2 of my 5-a-days. It was so delicious that I would stop by and pick up an order anytime I was in the area even when I wasn’t hungry. I would just eat it later. Yes, the dish was great even when it was cold. Then one day the lady changed the recipe. The pork was no longer crispy and fatty, but tough. Now I could count the number of measly cuts of kale on one hand. The dish had become just rice with a sprinkling of tough pork and a hint of kale. I never went back. I’ve also had a some-what opposite experience. There was one restaurant where I thought the service was okay. But, there was one guy that annoyed me. He might have been the owner’s brother or husband. He seemed to be the fix-it guy and errand boy. Most of the time, he talked with people walking by or he would start yelling into his phone. The part that got my ire up, was that he would do this while standing on my shoes. Like most restaurants on Koh Tao, you enter after taking your shoes off. Shoes are left by the entrance or first step. Most people, when walking into a restaurant would step over or around shoes, but not this guy. He stepped right on them. I would move my shoes out of his way, thinking he was just not looking where he was going. But then he would walk over to the new spot and step on my shoes again. I kept putting the shoes in different spots where shoes might be kept and he would keep finding them and standing on them. At first I thought it was just a coincidence. But now I think he just didn’t like his feet touching the floor. He stood on the nearest shoes he could find. It’s like he was playing The Floor is Lava, but with the shoes of customers. My moving my shoes around just gave him more options of places to stand. I stopped going to this place for a while. Then, one day it rained that end of the world rain that happens every so often on Koh Tao. I needed food and this restaurant was less than a minute’s walk from my hotel. This time, I kept my shoes under my table. The guy found some other people’s shoes to stand on. With my shoes next to me, I could enjoy the restaurant. 2. I ordered fried potatoes, but this is a croquette! Many restaurants put their menus out near the street so people can look through it and decide whether or not they want to go in. One such place had “fried chicken” on their menu. I wanted some fried chicken so I took off my shoes and went inside. I ordered my food and waited. I went to another restaurant a few days later and order their deep-fried chicken. It was un-breaded chicken fried until 10 seconds before it burnt. It was dry and stringy. There is fried chicken being served on this island, but about 50% of the restaurants don’t know what it is. You just have to go through trial and error or pay close attention to the dishes that other people are ordering. But, do not assume what a dish is based on its name written in English. Breakfast at Cafe del Sol is always a treat. If you want great customer service, you have to go to the restaurants with more expensive menus or smaller places where the owner or co-owners make up the wait staff. Outside of that, you could just hope you’re interacting with people having a good day. From what I’ve learned about Koh Tao, some of the people you see working hard day in and day out with no holidays are from Myanmar. They are immigrant workers. I think we all know, generally speaking, how well immigrant workers are treated by their bosses and by their new country of residence. So, with that in mind, it’s easier to cut some workers slack when they aren’t too happy to see you. For the most part, the rudeness Mark and I have experienced has never been enough for either of us to never return to a restaurant. We might not go there as often as we go to one where we always get friendly service, though. There are days when I don’t feel like dealing with sulky waiters. That’s when I go to a pricier restaurant, like Cafe del Sol, to get a warm greeting as I’m lead to my seat. It’s not great for my wallet, but it’s great for my soul. I thought I was lucky to find such a short line at Da’s that day. Then the guy in front of me ordered 8 sandwiches. 4. Get food, a place to stay, a taxi, and diving lessons. Da’s Sandwiches is one of the few places on this island that only does one thing. She only sells sandwiches. She has a storage room and an umbrella under which she cooks. That’s about it for her establishment. Da does one thing and she does it well. That’s what draws the long lines of hungry divers. But most restaurants, even the fancy ones, are restaurants and something else. Most restaurants are also hotels, though many only have 1 or 2 rooms to rent. Some also have a taxi service. Many are, or are connected to, dive shops. Many also rent diving equipment. A few rent scooters, do laundry, or sell tickets for boats, trains, and buses. When I first got to Koh Tao in January, I picked restaurants based on how close to the beach they were. I love a good beach view, especially at sunset. The dishes were pricey, but it was worth it, right? I had to be honest. The food at many of these sea-side restaurants were at best okay, at worst terrible. Their food was overpriced and tasted like a bland version of what their competitors across the street were serving. And yes, I mean literally across the street. Restaurants on Koh Tao are a dime a dozen. Across the street, they don’t have a great view. They have to keep the tourists coming in by some other means. Since many of them don’t have cheery dispositions, nice wall paper, or air conditioning, they have to cook good food. That’s all they have to offer. My advice is to eat delicious food at dinner time at a nice cheap restaurant. When you’re done, cross the street and sit at the beach to watch the sunset. Then leave before the bugs start biting. There are exceptions. Sairee Cottage Diving, a restaurant, dive shop, and hotel, has a really great BBQ set menu that’s not too expensive. It’s 120THB for 2 skewers and a potato (baked or French fried). That’s a very reasonable price and it tastes really good. They have other items on their menu, but the skewers bring in the crowds. Burgers on Koh Toa are expensive, costing something like 250THB. There is a huge temptation to just walk into the nearest pad thai place and order the 110THB cheese burger on their menu. This only leads to heart-break and anger when you realize that the chef had only a vague idea of what a hamburger is. Common missteps are a sweet burger, a huge bun and tiny burger, not having real ketchup or mayo, adding curry to the burger, using cabbage instead of lettuce, or using sweet buns. Pook, on the Mae Haad side of the island, is the only place that had both good Thai food and decent burgers. The best burgers are made at Hippo Burger Bistro. The second best are made at Cafe Culture Coffee. Both are in the Sairee Beach area. Cafe Culture is on the beach, but they are close by 22:00. Hippo has the more expensive burger. And, they have buffalo wings, which they call hot wings. Their “buffalo wings” are just BBQ wings. It’s confusing. Try the street food. There are many little streets where vendors hang out. They usually start setting up around 15:00 or 16:00 after the hottest part of the day has passed. Some vendors will be there at the same spot everyday at some given time. Some have their grills attached to scooters, allowing them to move around the island. Others are even harder to pin down. Some vendors are there some days and not others. There is one lady, that I know of, that sells spring rolls sometimes and fried things other times. So, if you see something you want to try, get it. It might not be there tomorrow. Mark’s thinking about getting the fish of the day at Seafood by Pawn. Don’t worry about getting food poisoning. I don’t know of any tourist on this island who has come down with it. Mark and I eat anything that catches our interest whether it be restaurant or street food. We even ate sushi a lady was selling from a cart the other day. (The sushi was kept in a cooler with ice. We checked first.) Just use common sense. If other people are also buying from that vendor, it’s most likely okay. Wash your hands. The food on the island is most likely not going to get you sick, but everything else will. There are stray dogs and cats everywhere. Tourists pet them, then shake your hands. Now you have stray dog germs on your hands. Wash them! Wash your hands after you use the bathroom. Wash your hands before you eat. Wash your hands after you put on bug spray. Wash your hands every time you get the opportunity. You will cut down on so many illnesses by simply washing your hands. The shakes aren’t that healthy. Many people think that the shakes you get here are soooo good for you. They are not. Okay, there are a few shake shacks that make their drinks with just ice and fruit. But most places add syrup; lot’s of syrup. The shakes are delicious, but keep in mind that they do have a lot of added sugar. Don’t forget 7-Eleven. There you can get toasted sandwiches, cup noodle (the hot water dispenser is in the back of the store), cold drinks, fruit, snacks, and microwave meals. It’s not my go to choice since it’s not that much cheaper than a nice cheap pad thai shack. But, it’s always open and the toasted sandwiches are really good when you want something familiar that’s not too expensive. The Lemon Thai Iced Tea is so good it can ruin your life. I started drinking the lemon Thai iced tea at Koh Tao Chicken and Rice. I was hooked on the stuff very quickly. I got up to 2 or 3 cups a day. The stuff is so good. But then I stopped sleeping. I felt so tired and sleepy, but I could not sleep. I got jittery and I could not stop shaking. I had to quit. I still get a cup of ice tea, but I limit myself to 1 cup a week. Mark never had this reaction to the tea, so it might just be me. Try something new. You never know what you’ll find. So that you’re not wasting your time, I will tell you that if you are going to visit Koh Tao for a week or two this entry is not for you. This advice is for the people staying on Koh Tao for a month or two or maybe even longer. There is a secret to this island that you might not find out about until you get here. (No, I’m not talking about the serial killer.◊) The secret is that the longer you stay, the cheaper the room rate for hotels can be, if you’re at the right hotel. They don’t usually put this information online. This can be a good and a bad thing but, I will get into this later. Before we go further there are somethings about life on Koh Tao that you need to understand to fully appreciate what you’re getting at your hotel. The electricity goes out quite often. It can go out for an hour at a time or it can be off and on in 2 minute increments over the span of 4 hours. This happens about once to twice a week. There is nothing the hotel can do about that other than buy a noisy, stinky, expensive generator to make their own power. Most hotels do not have a generator, but many restaurants do. When the power is out, use that time to take a walk, go for a swim, take a nap, wait it out with a good book, or head to a restaurant. Service in Thailand is a little different than back home. Back in the US customer service is key and the customer is always right. People expect service with a smile and so on. But here in Thailand unless you are in a fancier restaurant/ hotel or you are dealing with the owner of the business you will not get good service. Employees don’t care unless they are making good money. I get the feeling that many of the people in the service industry here are someone’s cousin being forced to work for just room and board, because that’s how they act. Don’t take it personally. They don’t hate you, just their job. I tell you #3 so that you keep this in mind when reading reviews of hotels and restaurants online. 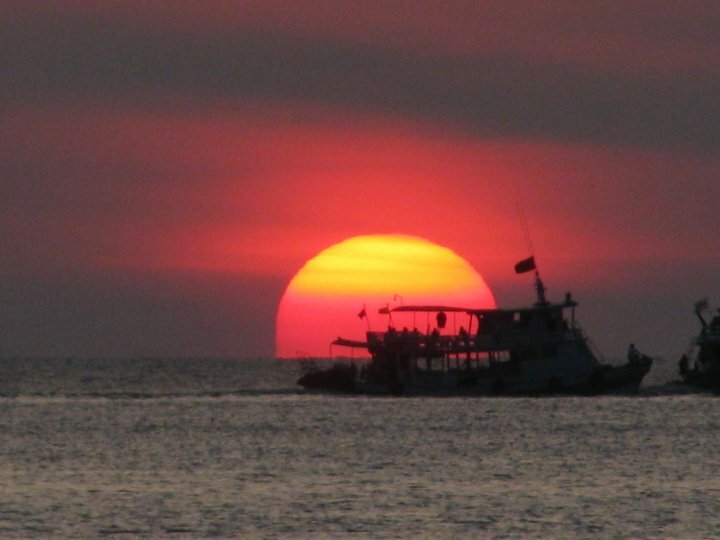 Many reviewers write about their service on Koh Tao like it were something back home. They will write about wait staff not greeting them when they entered a restaurant, as they would back home, and how they were just handed a menu and taken to their seats. What they might not understand is that maybe that waiter is just the owner’s kid who is not getting paid. Maybe she speaks no English and just wants to get back to doing homework. I know, it’s annoying when you get bad service. And, if the choice comes down to an establishment with a friendly staff and one with a staff that sits in the corner and glowers at diners while they eat, I will usually choose the friendly one. But, about 80% of the businesses on Koh Tao have a customer service problem but these tend to costs a lot less to patronize. So, if the staff really makes you feel uncomfortable, don’t go back. But, if you’re satisfied most of the time, don’t let little incidences bother you if you like the product overall. Some of the best dishes are sold by people who hire sour waiter-staff. Maybe their sass makes the food spicy? With that in mind, let’s move on! Paying for your hotel with the monthly rate is a lot cheaper than paying with a daily (nightly?) rate. When you do the math, 1 month’s stay when paying monthly can cost about 14 day’s stay when paying at the daily rate. So, if you are staying more than 2 weeks, even if you don’t stay for a whole month, you might want to ask for the monthly rate. Just remember to do your own math since the rate changes from hotel to hotel and season to season. The problem with looking for this monthly rate is that hotels almost never post it online. You can check out bookings.com, agoda, and other sites for the daily rate, but you will never see the monthly rate. You will have to show up in person and ask at the front desk what the rates are. This might be a good thing. When you go to agoda, for example, you can see photos of the hotel and its rooms. But photos don’t always tell the truth. A lot of times photos are cropped in such a way to make the hotel room look nicer than it really is. Or, what happens a lot on Koh Tao and in highly touristed areas, the photos were taken when the hotel just opened… 20 years ago. No renovations or repairs have been done since. So, showing up to ask about the monthly rates give you an opportunity to look at the room you might get. Hotel receptionists are happy to show you some rooms. Well, some aren’t happy, but they will show you some rooms anyway. Take notes of what you liked and didn’t like at the hotels. The thing with renting a hotel room with a monthly rate is that water and utilities are not always included. (Also, you might have to buy things like toilet paper, shampoo, and soap yourself.) Sometimes they are and the place is super cheap. The place Mark and I got when we just arrived cost 10,000 THB a month with water and electricity included, but I thought the place was a dump. It was a tiny little air conditioned room with a small “toilet/shower”*. The room had a window the size of a science textbook and it looked out to a busy road where drunk people would walk at 3:00 am and yell at each other. I have met a few people who were guests at that same exact hotel I hated and they enjoyed their stay. They were young single guys who spent most of their day underwater doing scuba stuff. They only went to their hotel room at night after getting super drunk and yelling at other drunks on their walk home. To each their own. *A “toilet/shower” is a all-in-one type bathroom where the shower is right over the toilet. It’s a common find in south east Asia. There is no shower curtain; there’s just not enough room for that. When you take a shower you have to remember to place the toilet paper outside or else it will get wet. After the shower, the toilet seat is wet because EVERYTHING is wet. I hate “toilet/showers”! Most of the time you can just show up and find some hotel. It’s a little harder in the peak season (December to March and July to August), but it can still be done if you don’t care too much about where you end up. I care about where I end up, so I would find a nice hotel for the first 2 or 3 days. During that time go from hotel to hotel checking rates and find your longer term hotel. Don’t rely to heavily on this. There have been so many times in my life when I’ve asked friends and co-workers for advice on a place to rent and got nothing. It’s not until after I’ve found a place, signed a contract, and moved in that useful information starts pouring in. Everyone always knows what you should have done, but they never know what you should do. Sometimes you get what happened to Mark and me when we got to Koh Tao. Everyone recommended the crappy hotel we were already checked into. They all said, “Oh it’s a marvelous place!” Just because a place doesn’t have rats and roaches, doesn’t make it amazing. But every once in a while a normal person with normal tastes will give you normal advice. 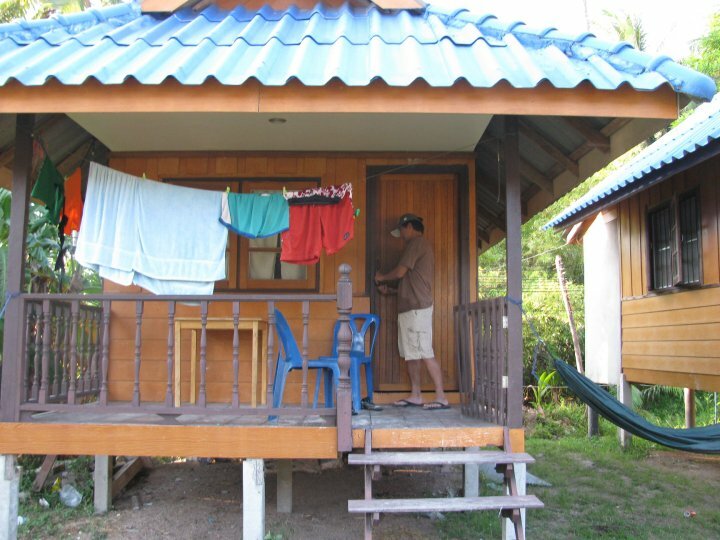 That’s how Mark and I got our third hotel on Koh Tao. It’s a new hotel that’s actually still under construction, so there aren’t too many guests. (There are 2 construction workers and they are surprisingly quiet.) The hotel is off the beaten path, so we would have never known about it if one of Mark’s scuba pal’s hadn’t recommended it. Make sure to ask people who are on Koh Tao when you are there. Don’t ask someone who was here 6 months ago. Nothing on this island stays the same for long. Even that serial killer changes up his M.O. every few weeks.◊ A hotel that was fantastic in January might have a new manager in April and soon after becomes a terrible place to stay. Or visa versa. Consistency is not something that you often get here. ◊ That’s a joke, but there might really be a serial killer on the island. Look at the information on Koh Tao below. There are hotels all over the island, but these are the two main areas. Most younger backpackers head to Sairee Beach. That’s where louder bars and restaurants that stay open later are. Mae Haad, near the docks, is more quiet. After 10:00 pm only 7-Eleven is open. One can easily walk from the docks in the Mae Haad area to the end of Sairee Beach in less than an hour. You don’t need to hire a taxi unless you don’t know where you are going and you are lugging heavy backpacks. What I mean is, if you want a hotel that comes with a pool, keep looking until you find one. But if what you want is a hotel with a tea kettle, then look for a nice hotel and if it doesn’t have a kettle, just buy one. There are a few hardware stores, grocery stores, and shops that sell stuff like that. For more expensive items check out Koh Tao For Sale. Hey, you could even get your used scuba gear there. If your hotel room faces a road, it will be noisy. If your hotel room faces a jungle, you will hear roosters crowing at the crack of dawn. If your hotel room faces a pool, you will hear drunk people yelling and splashing around at night unless the pool has a closing time. Check to see if there is any construction going on at or near the hotel. Sometimes construction work only happens during the day when you’re gone anyway. Sometimes there are only 2 or 3 workers who don’t really make that much noise most of the time. Sometimes they use heavy machinery and they start work at the crack of dawn leaving you no peace. If your hotel is near the beach, you will get bitten by bugs every day around sunset. Look for a hotel with screens on the windows. In reality, screens in Thailand are almost as rare as unicycle-riding unicorns. Buy bug spray, even if you’ve found one of those magical hotels with screens. You can find Off in every store on Koh Tao, so there is no need to bring any with you. You can also find hydrocortisone in every pharmacy on Koh Tao for the day after you forgot to use Off. If your hotel room is on the first floor then everyone who walks by can see into your room. But, you don’t have to climb stairs. If your hotel room is on the top floor, you will have the best view. But, you’re going to have to climb stairs. Don’t be a fool. Get a room with a balcony. You might not want to pay extra for a suite with a kitchen, but a little kitchenette is nice. Some hotels have an area with an extra sink, a hot plate, and a microwave. It’s nice not having to do dishes in your toilet/ shower. Not every hotel has a monthly rate. Some hotels have a monthly rate, but only in the off season. Some places charge even less if you rent 3 months at a time. You could also make friends and rent an apartment with a real kitchen and living room for less than a hotel. Per person I mean. Instead of 3 people paying 10 Money Units each on 3 hotel rooms, you guys could pay 15 Money Units together for a 3 bedroom-apartment. You want a bathroom with good ventilation. It should have a window or a fan. Look to see if there is anything that is broken. Make sure it has comfortable chairs for you to use when you drink your afternoon tea or beer. Ask how much everything costs. When renting monthly housekeeping is usually done once a week for free. Some places, but not all, charge extra to change the sheets and towels. How much is the laundry service? How much is water and utilities? Some places include utilities up to some amount. If you go over, you have to pay extra. Ask how much most guests pay for water and electricity. Keep in mind that no matter how much time and effort you put into finding the right quiet hotel, you might still end up with idiot neighbors like this guy. He and his friends stayed up all night drinking, singing, laughing, and yelling at each other. The next day they were all passed out around the pool until way past noon, making it very uncomfortable for other people who wanted to swim. They did this 3 nights in a row. I was so glad to see those guys leave. Likewise, I’m sure that along Sairee Beach you might find people shushing party goers. It’s important to know what kind of hotel you’re in and not to get your areas mixed up. I’ve talked about our first hotel and our third hotel, but I haven’t said anything about our second hotel and why we left. The second hotel cost about 14,000 THB a month not including utilities. House keeping was free, but new sheets and towels cost 150 THB. It came with a view of the docks and not much else. But, we managed to spruce up the place with a couple trips to the hardware store. We bought a kettle, a clothes horse, and an ice tray. We were living the high life! We made friends with other guests and Mark recommended the hotel to several of his diving buddies. I would spend my evenings on the balcony talking with this guest or that one as we watched the sunset. Many evenings Mark and I would go out for dinner with someone from the hotel. The service at the hotel wasn’t great, but it wasn’t bad either. I enjoyed the hotel even though there were a few things I didn’t like about the place. For example, they had a pool, but they didn’t clean it often enough for my taste. (I only used the pool on very hot days or during the weeks it got cleaned.) I would have been happy to stay there during our whole stay in Koh Tao. But, our friends one-by-one all finished their diving courses and left the island. It seemed like in the span of one week everyone we knew packed up and left. New guests moved in. They were probably all nice people, but they were heavy smokers. I don’t like to be around when people are smoking. These guys would sit out on the balcony and smoke for hours. When they started their marathon smoking sessions I would close the window and turn on the air conditioning. The windows and doors of the hotel had a lot of gaps. So, even with the place closed up and the AC on, my hotel room would still fill up with cigarette smoke every evening. With no friends holding me to the hotel, when the monthly deadline came I decided to check out other options. The hotel we moved to next was bigger and had a little kitchenette. It was more expensive at 17,000 THB a month. But, this one came with 300 units of water and 10 units of electricity. Anything after that we had to pay for. Also, house keeping was done once a week with new sheets and towels for free. It was a lot more quiet and I really liked it there. I got more writing done and even started doing yoga. Take up as much space as you like, I’ll just try to sleep with my head hanging out the boat. I had in my coin purse 2 receipts; one said, “Koh Tao to Suratthani,” the other, ” Krabi to Koh Phi Phi”. All we had to do was stand out on the road near our hotel and wait for the travel agency’s taxi to come and pick us up. We were told that the taxi would come at 19:00, and the boat would leave at 21:00. But after waiting there for 10 minutes the bugs started biting. 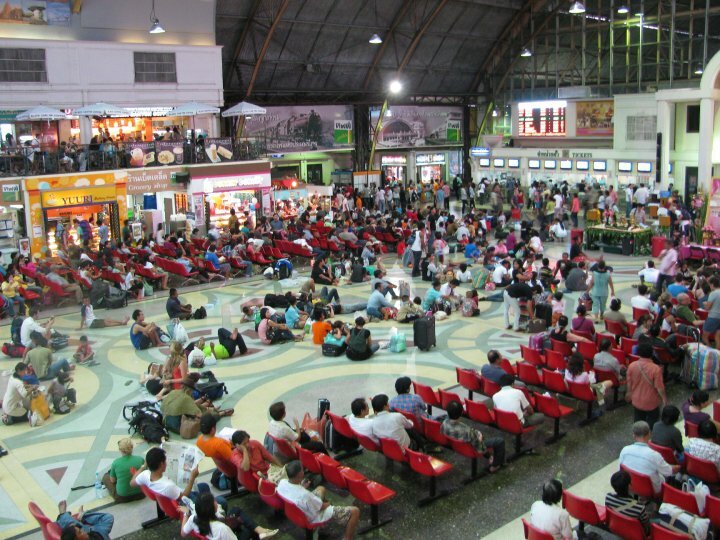 There is a phenomenon known as “Thai time” which makes it nearly impossible for anything in Thailand to start, end, arrive, or depart as scheduled. Knowing that the taxi was to pick us up at 19:00, I calculated that the taxi could actually arrive anytime between 19:30 and 21:30. So when our hotel’s free taxi to the dock showed up, we took it instead. We got to the dock around 19:30 and put our backpacks on the deck. I have a bright yellow bag that I use when my backpack and I must separate. I take important items from my backpack and put them in my yellow bag. These include, my passport, any money or credit cards, all uninsured electronics, a pair of socks, and long-sleeved T-shirt, and my inflatable pillow… plus what ever Mark tosses in there. We left for about 1.5 hours to a bar that was showing a movie starring Mark and his diving classmates. When we came back to board the boat and settle in, we were told that we had “no number”. The ticket checking guy said, “no number” again and point to the beds on the lower part of the boat. I tried ever conceivable way to ask the annoying man where “no numbered” people are supposed to sit, but all he would say was, “no number.” Mark decided to just pick an empty spot so I joined him. We just sat back and watched what happened. That’s when I realized that our boat had been oversold. I looked around the boat. I wondered why there were people laying in the path that should have been left clear as a walkway to the bathroom. They, I later learned, also had no number. I noticed that these middle people had mattresses and pillows and that there were numbered spots that had no mattresses and others had missing pillows. Then the people whose spot we were apparently in, showed up. We had to get up and stand awkwardly to the side. We waited until everyone who was to board had boarded and ask Mr. Unhelpful once more where we were supposed to sit. He never spoke a word to us, but just counted his tickets. He counted them about 5 or 6 times before he grabbed our tickets from out of Mark’s hands and ripped them up. Then he wrote us new tickets, with numbers, and handed them to Mark. Mark looked at the tickets’ numbers and then to the corresponding beds. “These are taken.” Mr. Unhelpful did not respond. So Mark repeated, “These are taken. People are in them.” Mr. Unhelpful waved Mark off in disbelief. Mark pointed to the spots. Mr. Unhelpful followed Mark’s outstretched arm with his eyes. Then he grabbed the tickets from Mark’s hand again and started counting tickets once more. At this point, 2 more people had come to Mr. Unhelpful’s table. They had numbers, but there were no mattresses. I looked down at the people in the middle. Most of them had mattresses. But the couple could not get any information out of Mr. Unhelpful. He was busy recounting tickets for the 4th time and would need a 5th and 6th time before he was ready to communicate with anyone in this realm. Mark and I started to ask about bed 114 and 115. They were empty and had been empty this whole time. But Mr. Helpful was still on recounting round number 5. Those beds, 115 and 116, that were left empty had owners. Owners that didn’t show up until 21:50; ten minutes before the boat left. Yes. This 21:00 boat actually left at 22:00. When he was done he gave us new tickets. These were technically empty. The man in 74 was fast asleep and sprawled out on both space 74 and 75. The man in 75 had moved his into 76. 76 was Mark’s newly assigned number. I was 77. This bed was where the girl in 78 had put all her crap. People will pile 6 souls on a motorbike, 8 people in a sedan, hundreds on a subway… Max capacity is taken as a challenge and every time I see a pickup truck speeding down the highway with 20 people dumped in the back I can tell that the driver is beaming with pride. We managed to get the sleeping man to move over a bit. I, passive-aggressively gave the girl in 78 a dirty look, but she didn’t move her bag until she realized that I would use it as a pillow if she didn’t put it somewhere else. I then spent a good part of the night pushing her arm off of me. I would move her arm and within 10 minutes I would feel it on my back again. She was a determined cuddler. At one point I got up to use the bathroom and the small gap that had been my spot was gone. Her right arm and leg had filled in the space. I carefully lay down on my side in Mark’s spot, trying not to wake her. Then feigning night terrors, I suddenly flipped over on my back, crashing down heavily on an arm and leg in my spot. She didn’t want to cuddle after that. 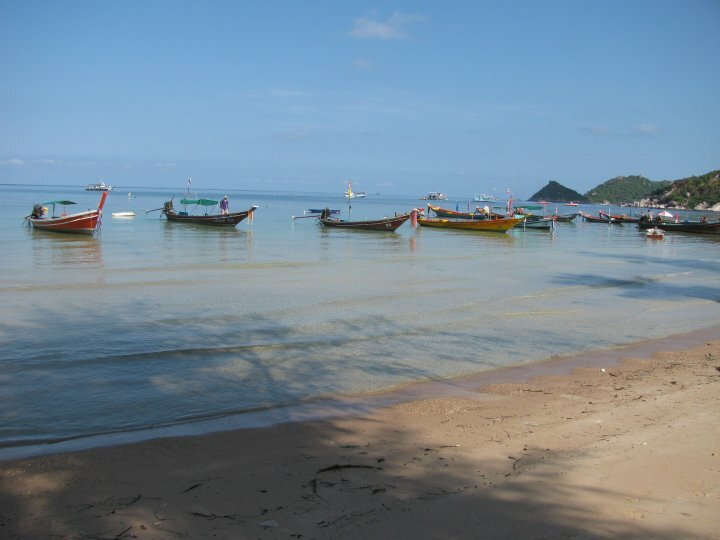 There are hundreds of travel agencies that will sell you tickets from Koh Tao to Koh Phi Phi. There is a fast boat (1,050THB), that leaves at 9:30 and a slow one (950THB) that leaves at 21:00, to Surathani (สุราษฎร์ธานี). 1. Take a train to Surathani, then a bus to Krabi. Go to Krabi dock and take a ferry to Koh Phi Phi. 2. Take a bus to Krabi. Go to Krabi dock and take a ferry to Koh Phi Phi. 3. Fly into Krabi. Go to Krabi dock and take a ferry to Koh Phi Phi. The ticket from Koh Tao, will also include a bus ride from Surathani to Krabi and a boat from Krabi to Phi Phi Island. I think that it is better to book your ticket through an agent, because the price includes transfers from docks to bus stations, and bus stations to docks. It is not fun dealing with pushy tuk-tuk drivers at 5:00 in the morning. Make sure your agent has given you a bed number for the boat. Try to get a bed on the top. The picture above is of the bottom part of the boat. people with no bed numbers must fight for a space in the middle which is actually the walkway passengers use to get to the bathroom. 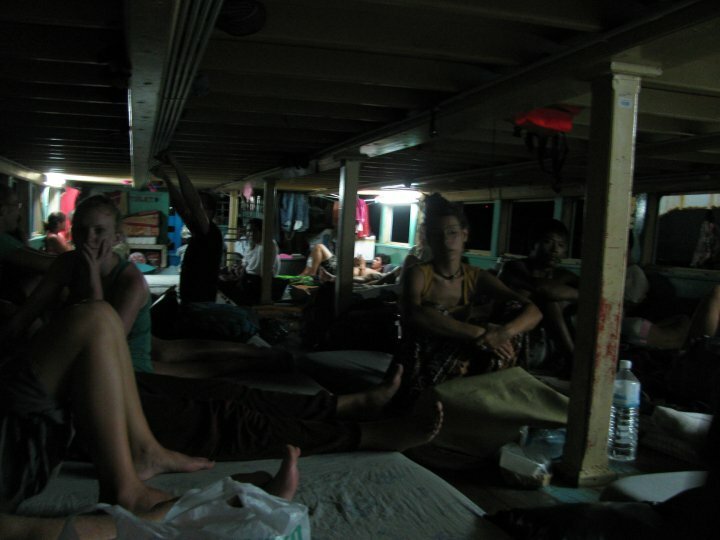 No one is allowed to sleep in the middle on the top part of the boat, so the people there can easily get to the bathroom. I also recommend bringing a pillow and a blanket. 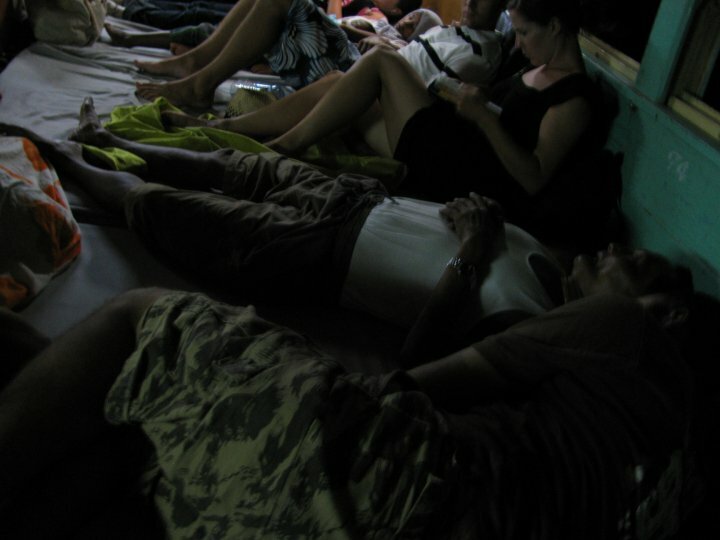 People tend to hoard the pillows and there are no blankets even though it does get cold on the boat. Mark and I had sleeping bags and inflatable pillows that we travel with. Make sure to take things to keep you warm, along with your valuables, out of your backpack before the crew stores all the luggage below. There are no trains to Krabi. 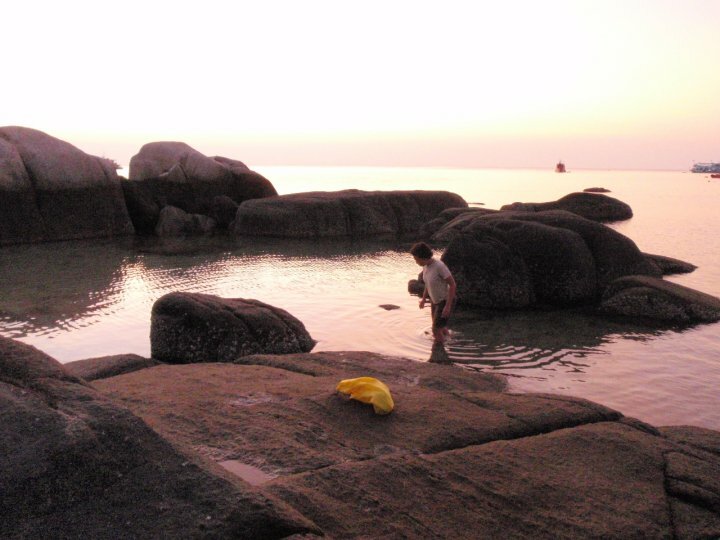 The beach at Koh Tao is great for kids. It’s not very deep. In fact you can walk right past most of the docked boats and not even get your knees wet. There were plenty of fish and corral to look at so, needless to say, snorkeling is big on Koh Tao. 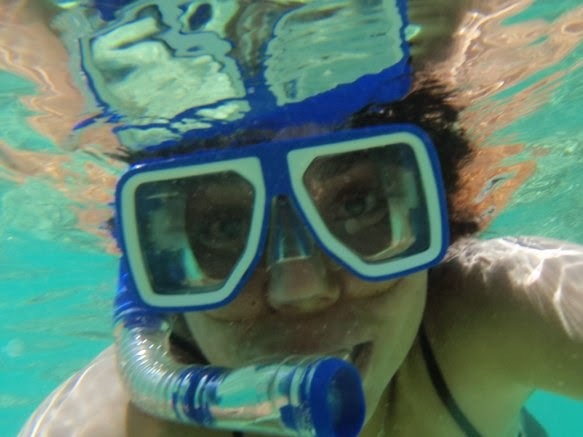 Because I have claustrophobia and the water here is very calm and shallow, I used my time here to get comfortable with a mask and snorkel on in the water. 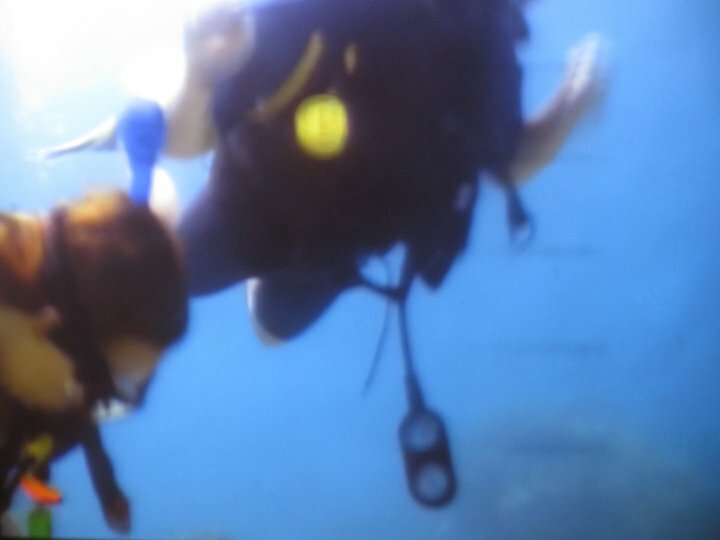 The last time I went snorkeling was in Vietnam. I jumped into deep water then put on my mask. I felt so enclosed that I ripped it off before I could even look at some fish. I had to change the diving mask for some swimming goggles. Goggles aren’t that great when it comes to looking into salt water. While I spent most of my time swimming and snorkeling by myself, Mark was off in his class. He was earning his Open Water PADI diving license. Koh Tao is a great place to learn to dive. There are hundreds of dive resorts and the prices aren’t very expensive. Most places will give you a discount on room rates when you sign up for a course. Mark would leave early in the mornings with his fellow dive-mates and come back late in the afternoon. 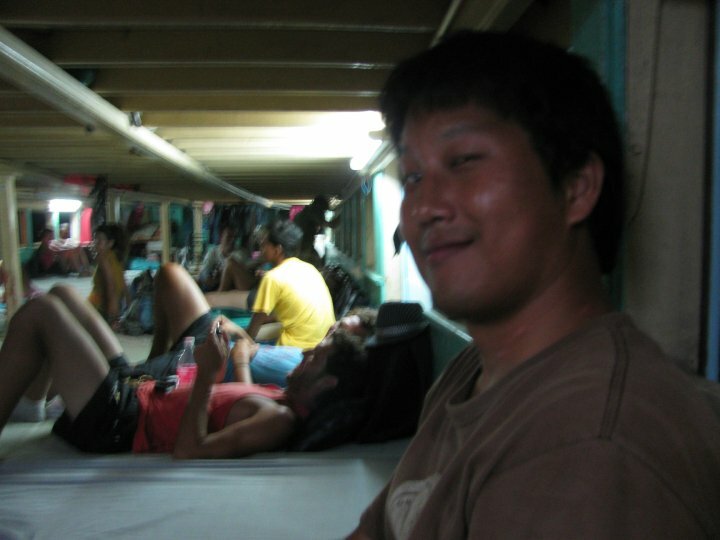 I entertained myself with swimming, eating, sleeping, and talking to other backpackers. One question I get asked a lot is, “Where are you from?” I know that because I haven’t lived in the states for a while my accent has changed. So most English speakers will guess from the fact that I speak English very well, that I at lease come from an English-speaking country, though they might not know which one. For those whose first language isn’t English, they might not be able to hear an accent, since I don’t have a strong accent pointed in any particular direction. They try to look at me to make their guess. They are always wrong. Sometimes, amusingly so. Can you tell where I’m from? Take any of the southern line trains. Remember Chumphon is not the last stop. The train might not get there on time so don’t get off unless you see signs saying Chumphon. Many stations do not have a sign clearly saying the name of the station, but Champhon has many signs clearly written in Roman script. About 6 hours, more or less, depending on the speed of the train. If you are riding in from Bangkok you DO NOT want to take a 3rd class seat for this journey. It can be spelled Chumphon or Chumporn. Just a little way to help you get lost. You can buy tickets on the ferry to Koh Tao, Koh Samui, and some other nearby islands. The prices are 450THB for a 3.5 hour ride on the slow boat and 550THB for a “2.5 hour” ride on the fast boat. My ride on the fast boat was actually more like 3.5 hours, but it was a very fast boat. It did leave later that advertised. I don’t know if this means that both boats are slower than advertised or the same speed. 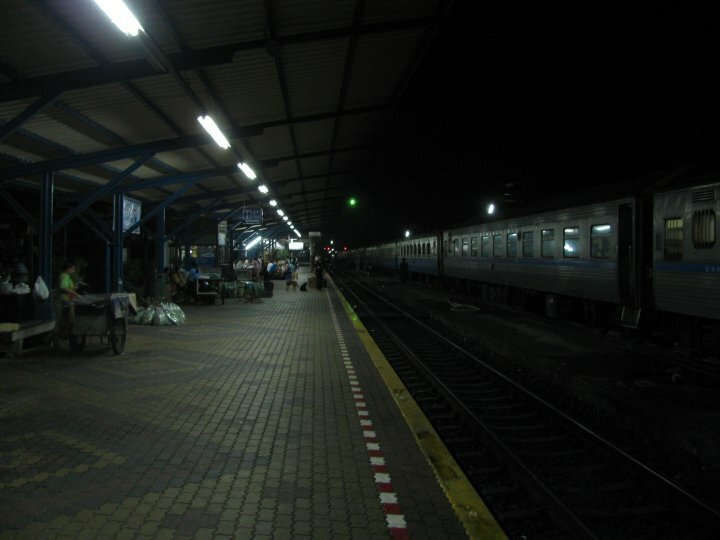 Well theoretically it should take about 3 hours to get to Koh Tao from the Chumphon station, but… We arrived late at the station at 5:15 in the morning and we didn’t reach Koh Tao until 11:00 in the morning. The cost of the ferry includes a ride to the dock from Chumphon station. There is no need to buy tickets before you get to Chumphon. The ferry dock is not on my map because I have no idea where is it. But once you get to the Chumphon railway station people selling ferry tickets will find you, take your money, stamp your hand or put a sticker on your t-shirt, and make sure you get to Koh Tao or whatever island you want. Once you get to the dock on Koh Tao, head left along the beach. Go until you see a giant cement turtle. It’s about a 5 minute walk from the dock. The cost of a bungalow by it self? …I’m not sure. But the price gets cheaper when take diving lessons here. Cost of the courses depends on which course you take. The one that Mark took was the beginner PADI open water course for 9,800THB it came with 200THB accommodations. Crystal Dive Resort owns 2 sets of bungalows, one near the dock and another one that’s about a 20 minute drive away. The dive classes are at the one near the dock, but the other resort is nicer. If you stay at the one that is not near the resort there is a free taxi, provided by the resort, that will take you back and forth. They always come in time to take anyone that needs it to get to their dive class. I would not recommend 3rd class seat tickets for a long train ride, ever. 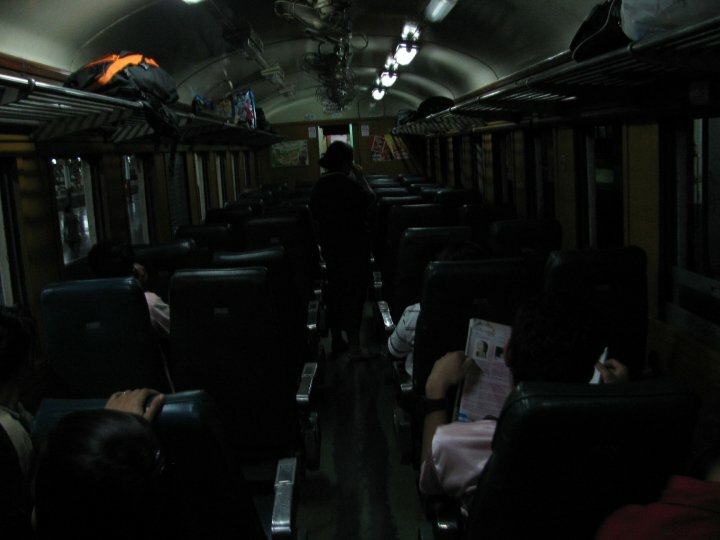 For the 9 hours we were aboard the train, it was torture. A third class seat means no a/c, stinkier than normal bathrooms, lights that never get dimmed, and people ready to take your seat if you haven’t occupied it for the last 10 minutes. They will get up if you can prove that you do have tickets for the seat, but you need good proof! It’s not so much that the seats are uncomfortable, because they aren’t. …well not for sitting. For sitting the seats are more than adequate. They recline pretty far back. In fact the person in front of you can recline right into your lap! They just do not make very good beds. It may not seem that way when half the car is snoring like a choir of chainsaws. But, I had a hard time sleeping without parts of my body going numb. Then there are the flies. They dance around your head and sing in your ears. The more you swat at them the more resilient they get. All of this is not so bad, because it gets worse. Whenever I did manage to fall asleep the train would eventually pull into a station. Then wretched vendors would get on board and yell out their wares. They wouldn’t just wake me up. No! I would be startled awake. I would wake up terrified and my heart would be racing in my chest. Looking around in a panic, to find the shrieking screams coming from a little old lady or man selling horrible soup. I think this is one of the stages of hell. Do people really need to eat at 1:00 in the morning? I firmly recommend planning ahead of time so that you can get sleeping compartment tickets before they are sold out. Would I have been better off in one of those luxurious tourist buses? Hmmm. I would still be woken up several times during the night. I would still have been offered sin soup. But, I would not have had to deal with the flies or the seat stealing. So, maybe. If you ever need to buy tickets for a train leaving the Hua Lamphon train station, it’s best to go online first and write down the train, class, and type of seat/sleeper you need. If you forget to do this, it’s no big deal. There are some helpful people, seated right at the entrance nearest the Hau Lamphan MRT (subway) station exit. You can just walk up to them, tell them where you want to go, and ask for a train schedule. They’ll even point you in the right direction to buy your ticket. My mistake came when one of them asked me if I wanted to buy bus and boat tickets from Chumphon to Koh Tao too. At first I said, “Sure, why not?” The lady that asked me the question then beckoned me to follow her. As I made my way into the station I remembered that in my experience with Thai trains, I have not known any of them to get to their destination at the time stated on my ticket. In fact once, the train never made it all the way there and passengers were told to “take taxi”. No refunds or apologies were ever given. I stopped the lady and told her that I had a change of heart and why. “I just want to buy the train ticket.” She told me that it was okay, and that I should follow her. She then proceeded in a direction opposite to the ticket counter for the trains. Me – “But Ma’am, isn’t it over there where I buy the ticket?” I pointed where I thought I should go. Then I thought, maybe the ticket counter I had pointed to was where you buy tickets for trains going north, and I had to go upstairs for tickets on southbound trains. When we entered a travel agency I realized that it didn’t matter what I said to the lady. She would always reply that it was okay and I should follow her. Before things got even more out of hand, I told the travel agent that I had changed my mind and I only wanted to buy train tickets. This guy had clearly missed the point. Me – “I don’t want boat tickets.” This comment made no sense to him. Ticket Man – “You take 19:30 train. Get to Chumporn 3:37. Train can’t be late. But, if train late, no problem. Boat leave 7:00. No way to be late for boat.” He started the call to get me train tickets. “Oh it full. Why you don’t take bus?” He then pulled out a laminated flier for a bus company. My last bus-company bus was not too pleasant. The driver drove like the devil was chasing him. Every time I fell asleep, the bus attendant woke me up asking if I wanted something to drink. At midnight the bus pulled into a side-of-the-road diner, turned on the lights, and played loud horrible music to get everyone up and out of the bus to eat some nasty soup that tasted like sin. I explained all this to the agent, only leaving out the sin-soup. Ticket Man – “Then go down stairs.” He then motions to the lady to take me away. That’s when I noticed that there were other tourists waiting to buy tickets on a bus that came with soup. I would have felt bad, but I told the lady and the agent that I just wanted train tickets. It was them that lied to me and felt that they could change my mind. When we got to the ticket counter, the same one I had pointed to earlier, I bought my tickets. All the decent classed seats and all the sleepers were sold out. I took what was left. The lady stood next to me the whole time. Then she looked at me as if I had been wasting her time all along. Her face dead and void of expression except for a small eye roll. With no emotion she said, “It’s okay.” and walked away from me in disgust. …And turns out that we were both right. The train I took was supposed to get to Champorn at 3:37 in the morning. Mark and I almost got off at the wrong stop, because at 3:45 when the train stopped, we thought it was our stop. But seeing no one else getting off made us a bit suspicious. At 5:15 we pulled into Champorn in time to catch the 6:00 bus to the dock, and in time to catch the 7:00 ferry. I could have bought the tickets in Bangkok, but Thailand has an unofficial “no refunds” policy and I didn’t want to take any chances. The ferry dock is not on my map because I have no idea where it is. But once you get to the Chumphon railway station people selling ferry tickets will find you, take your money, stamp your hand or put a sticker on your t-shirt, and make sure you get to Koh Tao or whatever island you want.